Having worked successfully on projects for clients of Elevate2 during the last twelve month, I am very familiar with the attention to detail and keen eye for design of my client Alex, a self confessed perfectionist, which in our business makes for the dream client. Alex Lester, MD of Elevate 2 leaves no stone unturned in ensuring that anything representing his business is carried out in the right way to achieve the right result. Nothing is ever perfect, until it’s perfect. So when Alex approached me about his own marketing, talking about a complete rebrand of his business Elevate2, together with a new website, I was equally flattered and delighted to take up the challenge. 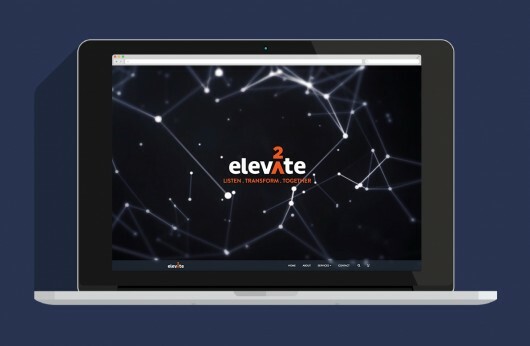 Elevate2 is a management consultancy with a difference. Alex firmly believes that most of his client’s already have the answers they need, his company’s role is to work with them to help them visualise this, thus enabling them to achieve their goals. His business is all about perspective, looking at problems in a different way to ensure the correct solution is realised. Based in London and with a client base across the UK, Elevate2 needed a professional image with a difference. This is not a company that blends in with the crowd, it stands up and dares to be different and our job was to ensure the new brand and identity allows it to do just that. We chose the subtle arrow device for Elevate2 because it is synonymous with progression, transformation and growth. Alex had carried out research into colours and was keen to use orange as an accent colour and to this palette we introduced grey/blue to balance out the brand and keep it corporate. The simplicity of the design allows for multiple application usage meaning it will work wherever it is needed, from pens and business cards, through to the website and brochure material. Unique, bespoke design reflecting client’s brief document. Fully responsive website adhering to latest Google algorithm requirements. Fully editable via a WordPress content management system. Suite of uniquely crafted icons and diagrams further reinforcing the strong branding of the website. Rotating video reel on homepage giving an impact on launch. Compressed file size to ensure loading time is minimal. “I have used Ultimate on several of my client projects, so this time I decided to use them for a total rebrand and website design and build for my own company. As always, Amy and her team were excellent at following and adapting to the company brief. This was then fine tuned in to a very professional, modern, unique design that perfectly reflects the company and its business style. It goes without saying that I will be using Ultimate on several more of my client projects”.